Shopping is a favorite pastime for many travelers but what to buy and where to buy with confidence can be problematic. From major cities to small villages, it helps when a local shares shopping tips. “If people want to buy amber in Cesky Krumlov, I tell them to forget it unless they know what they’re doing,” said tour guide Oldřiška Baloušková. She and I were strolling the 13th century town located in Czech Republic’s Southern Bohemia region and designated a UNESCO World Heritage Site. In centuries past the region was on the amber trade route, which explains its tourist presence today. Many shops displayed the gleaming yellow-to-copper-colored fossilized resin fashioned into beautiful jewelry to tempt buyers. “Usually amber sold here is by people from other countries. Some of it is good and some not so good,” Oldřiška continued. I was curious about who owned the shops in her hometown and asked her as we continued down a hilly, cobblestone path not suited for those with walking difficulties. “Most stores in the town center are not Czech-owned. The rents are too high. Owners come from the former Yugoslavia and some are from Bulgaria. The Vietnamese owners are the descendants of family members brought here by the Communists as laborers before 1989. They stayed on to own stores and raise families,” Oldřiška said. “So what do you suggest a visitor buy that’s an authentic shopping reminder of Cesky Krumlov?” I asked. Oldřiška’s list varied from jewelry to pencils to marionettes and more. She didn’t suggest glass items, a Czech Republic shopping mainstay. Better choices are in Prague. Garnet is a deep red stone, while moldavite is olive green. Both are mined in Czech Republic, fashioned into jewelry and sold throughout the country. Oldřiška advises the best shop for both is Granát Turnov, located across from the castle entrance. It’s a factory shop selling its own products for a lesser price than sold in someone else’s shop, not to be confused with factory-outlet shopping where prices are heavily discounted. There’s a wide selection of items set in 14 karat gold and sterling silver. Non-English-speaking staff. For purchases over 2.001 CZK, the shop gives non-EU-country customers a Tax Free Shopping form for a tax refund when leaving the EU. Bambas is a family-owned business that experimented with a new art form in 1990 that involved imported Italian leather and handbags. Today, there are 12 Czech regional artists who hand-paint each handbag, wallet and small leather good for an unequaled and trademarked fashion statement. The main shop (Latrán 15) is small, with stone walls and a cave-like feel. 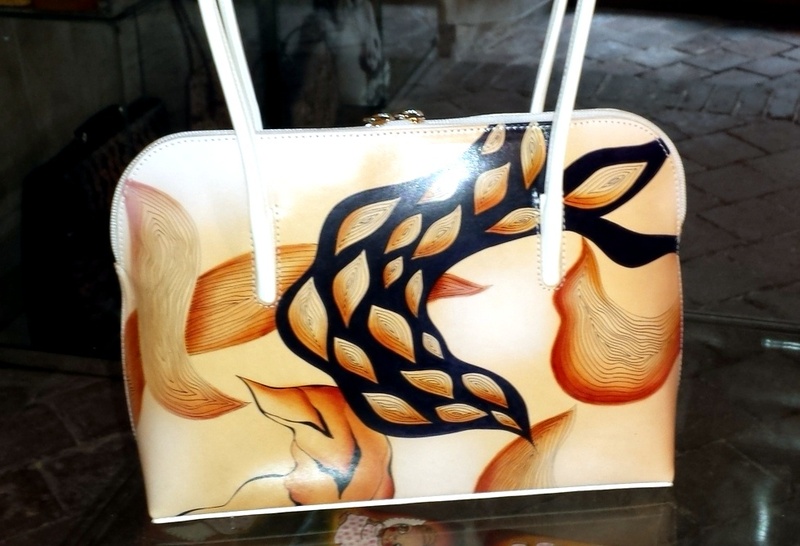 Gleaming glass showcases display one-of-a-kind handbags hand-painted with bright colors. There’s no design theme per year, just a natural evolution of what customers want, such as specific animals or designs personally submitted. Quality is superb and some customers remark that their purchases have maintained their new appearance for ten years or more. Bambas exports to other Czech Republic areas and has a website for sales. Handbags begin around $140 for a small one and can rise to $600 or more. According to Oldřiška, Czech Republic church attendance hovers around four percent. Fairy tales are more interesting than religion, which explains the popularity of puppets and marionettes. Devils and witches don’t represent evil; instead, they have playful, trickster and satirical characteristics. While marionettes and puppets are sold throughout the country, there are two special Cesky Krumlov places to purchase them. The Marionet Muzeum (Latrán 6) is a branch of Prague’s National Marionette Theatre and housed in the former Church of St Jošt. It showcases puppet theatres of yesteryear and a gift shop. Fairytale House (Radniční, 29) is owned by the town’s former mayor. Expect to pay 6,000 CZK and more for hand-carved marionettes made locally from linden wood. The craftsmen hail from Moravia and Prague. 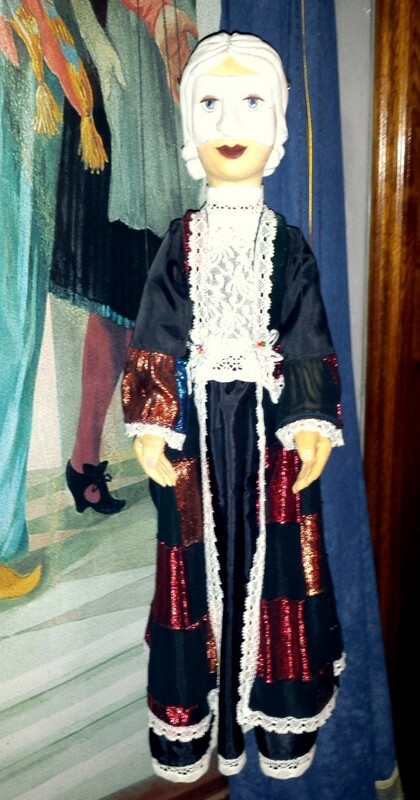 While the marionettes are usable, most people purchase them for decorative purposes (professional puppet theatre marionettes cost around 40,000 CZK). There’s a delightful museum on the second floor. Whiffs of freshly baked Old Bohemian gingerbread fill the air at Cesky Pernik (Latrán 54). The ancient recipe consists of flour, honey and herbs (no eggs). Hand-crafted, fruitwood molds used to bake the gingerbread reflect the social and religious life of the 16th and 17th centuries. The shop borrowed the original molds from a local museum to replicate designs. Gingerbread can be eaten immediately (shelf life is around six months) or saved for Christmas and other decorative purposes. All items are hand-painted; older Czech women paint traditional designs while younger women capture contemporary themes. Stop into Bon Bon (Latrán 20) for a chocolate boost. Best sellers are dark chocolate, chocolate with chili and marzipan candies. 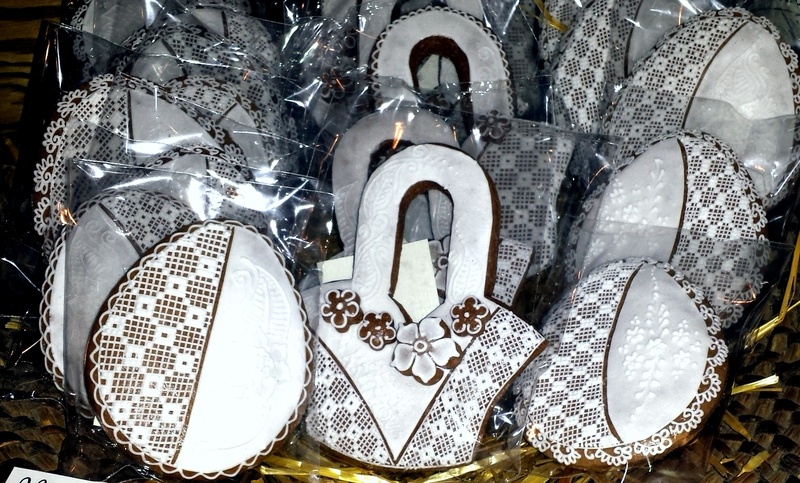 The shop’s factory is located in Tabor, a Southern Bohemia town with a chocolate museum. 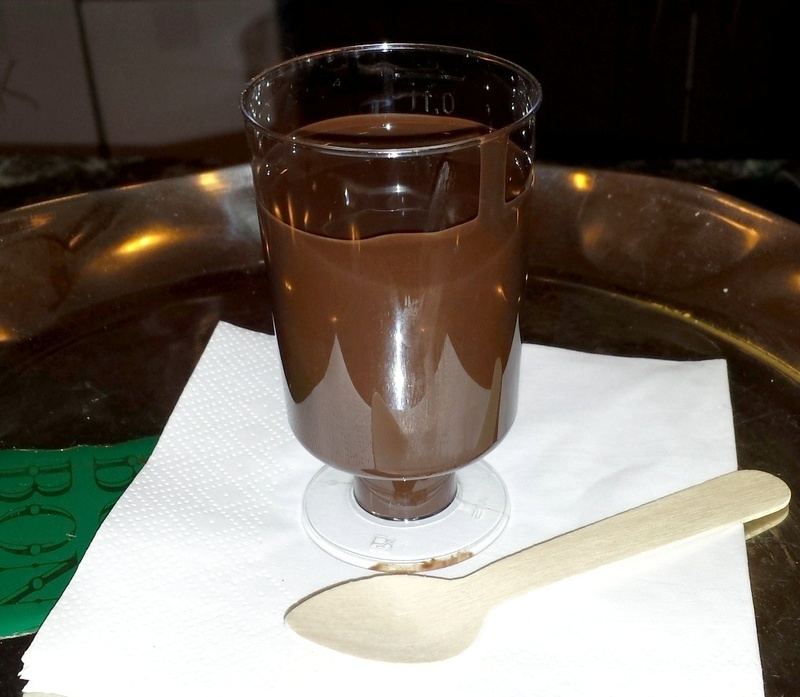 Devotees of hot chocolate can purchase a small cup (50 CZK) of dark chocolate some describe as a melted chocolate bar. The thick, intense-flavored liquid has also been compared to drinking pudding. Pencils may not top a shopper’s list but they are a must-buy in Cesky Krumlov. For Sudoku and crossword players who use a Sudoku pencil, that exclusive item is made by Koh-i-noor Hardtmuth, a world leader for 210 years in the production and distribution of first-rate stationery and classic wooden pencils. Their adorable shop (Kostelní 169) is steps from the Vltava River. 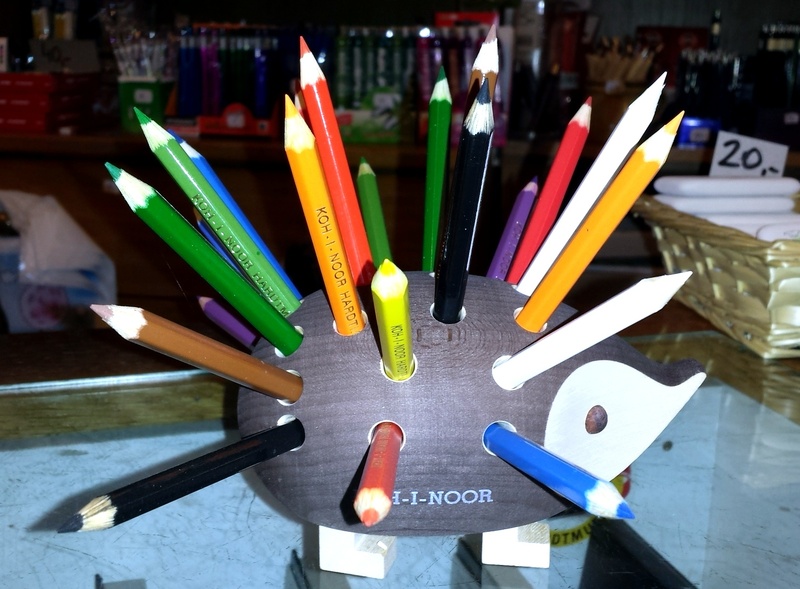 A popular item is the hand-made pencil holder that resembles a porcupine with pencils as quills. An excellent place to stay, complemented by the onsite Le Jardin gourmet restaurant, is Hotel Bellevue. Contact Cesky Krumlov official tourist office for information. My excellent and personable guide, Oldřiška Baloušková, can be reached at oldriskab(at)gmail.com or (420)737920901.